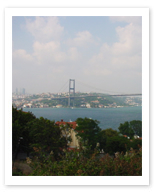 Mark Twain once waxed lyrical about approaching Istanbul by sea. He was right, nothing quite matches the sight of the elegant domes and minarets appearing majestically on the shoreline of the Bosphorus. This shimmering stretch of water really gives the city a sense of space and by joining the continents of Asia and Europe, the Bosphorus magically transforms the city. Tiny fishing boats bobbing in the wake of huge ships, freshly fried fish served at the water’s edge and children diving in to cool off in the heat of summer all add to the timeless attraction of this historical seaway. Taking the same route as did Jason in his quest for the Golden fleece, a boat trip from the Old City, where jostling buildings compete for space, towards the wide open Black Sea, is the best way to see Istanbul’s elegant side as the journey reveals grand old wooden houses, towering fortresses and picturesque coves.